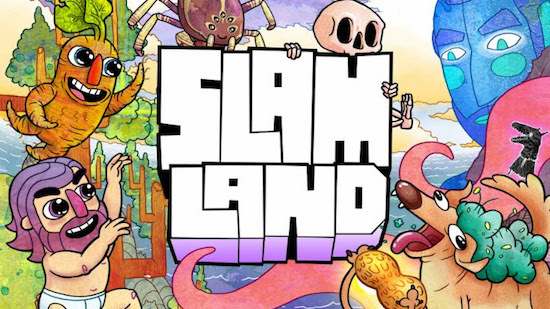 Slam Land, the competitive party game where brawling and balling meet in a weird and wacky pastime, dunks its way onto Nintendo Switch, PlayStation 4, Windows PC, and Mac on August 7, 2018. In this surreal, chaotic competition, an uncanny blue giant enlists a cast of comical competitors to slam one another into hoops for his own personal enjoyment. Grab up to four friends (literally) and square off in a multitude of local multiplayer modes including the hot potato-like Peanut Mode, H.O.R.S.E., and the craziest mode of all, Trash, in which garbage plummets from the sky waiting to be snagged and stacked into massive, dunkable piles!